Tract housing is a type of residential development in which many identical or nearly identical dwellings are built adjacent to one another. Tract housing was popularized in the United States when the building firm Levitt and Sons built four planned communities called "Levittowns" (in New York, New Jersey, Pennsylvania, and Puerto Rico); Levittown, New York, however, was the first and most famous. Rather than design and build each house individually, Levitt and Sons built thousands of nearly identical 800-square foot "Cape Cod style" dwellings. 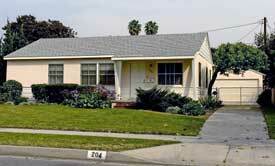 The houses had a simple rectangular plan with a single gabled roof and a centered front door under a low eave. The repetitive use of only a few plans reduced labor costs, because the home builders were not required to be craftsmen. By ordering materials in bulk and then producing a large number of units, developers could also keep costs down while raising profits. Developers began constructing tract homes in Fullerton in the mid-1930s, but tract development really accelerated after 1945. After World War II, Fullerton veterans (and ex-servicemen around the country), many of whom were living in crowded and sub-standard housing, began demanding housing of their own and plenty of space to raise their children. Demand was so pent-up that developers could not build the houses fast enough. Fullerton made history on May 25, 1950, when Jewett Brothers Construction Company, in a publicity stunt, set a world record by constructing a two-bedroom tract home in 57 hours and 57 minutes. In Fullerton firms first began constructing tract homes on land east of Lemon Street (Ash, Elm, and Rosslynn Avenues) and west of Woods Avenue ( Jefferson, Washington, Wilshire Avenues) in the central part of town. Soon afterward, tracts were developed on land east of Fullerton College ( Princeton Circle ), west of Euclid Street (Marie, Lee, Wayne, King, Elizabeth, etc.) and on property south of Valencia Drive and west of Highland Avenue (Elm, Knepp, Southgate and Rosslynn Avenues). 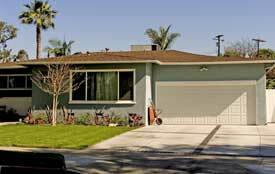 The first tract homes in Fullerton had detached garages, then small single-car attached garages, followed by two-car garages in the 1950s (as required by city ordinance in 1953). As home buyers sought more variety, developers began substituting materials and/or colors, and reversing the floor plan or orienting the plan differently on the lot. Over the years, most owners personalized their basic floor plan and appearance by adding new elements to exteriors as well as enlarging the living area of the residence. Archer, John. Architecture and Suburbia: From English Villa to American Dream House, 1690-2000. Minneapolis: University of Minnesota Press, 2005. Hayden, Dolores. Building Suburbia: Green Fields and Urban Growth, 1829-2000. New York: Pantheon Books, 2003. Kelley, Barbara M. Expanding the American Dream: Building and Rebuilding Levittown.Albany: State University of New York Press, 1993.